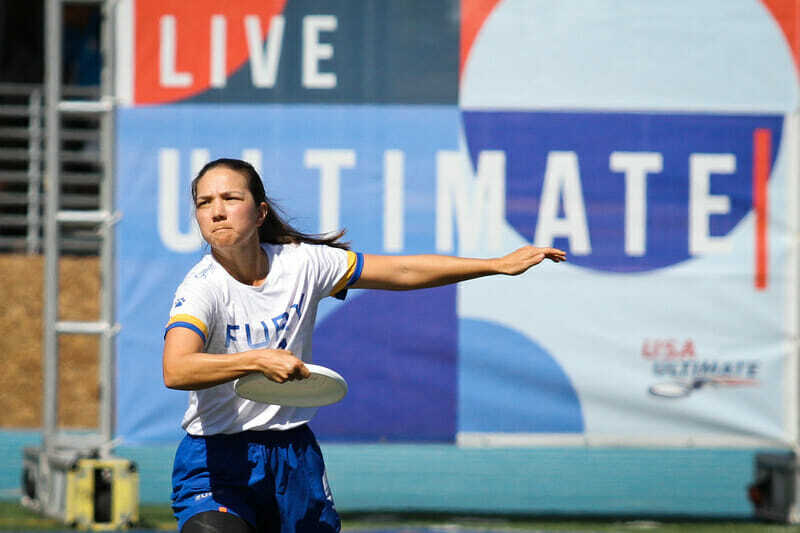 Ultiworld is pleased to announced our fourth annual Women’s Club Player of the Year award. While we consider both regular season and postseason performance, because of the nature of the club division, we weight success in the Series and at Nationals above all else. The All-Club teams are selected based on input from Ultiworld reporters, contributors, and editors. Ever seen a well-choreographed fight scene where one person dances through the combat?1 That’s Finney on an ultimate field. Her ultimate IQ and bulldog intensity have made her one of the most fearsome and well-rounded players in the Women’s Division. In the past two seasons, Finney has led Fury to two come-from-behind finals victories while playing more points than any other player on the field. It’s no longer enough to say that Finney is a hustle player, with her full arsenal of throws and smothering defense: she’s a force unto herself. Make no mistake, Fury definitely won Nationals by being the deepest team in the division. They have a level of talent that other teams struggle to match. Apart from Finney, no single player on Fury recorded double-digit goals or assists. Throughout their season, Fury showed that they could beat teams 27 different ways with 27 different players. But it takes more than talent to win a national title. In the end, it was Fury’s unquenchable drive and never-say-die attitude that helped them win in San Diego. Ask anyone and they’ll tell you, no one is more emblematic of that spirit than Finney, whose passion and focus is evident in her decisive on-field actions. Finney’s success this season has been made all the more impressive by the injuries she’s had to deal with. From the start of the season, Finney was dealing with shin splints, a recurring roadblock in her path. Still, Finney has shown time and again that she can work through her pain and be an effective player no matter the circumstances. She maintained one of the highest usage rates of any player in the nation this season, which included the added wrinkle of Club Worlds. At Nationals, Finney posted a modest 3G/13A/5D, which was still enough to lead her team in assists and tie for second in blocks. These stats don’t tell the entire story, either. Finney played the most points out of anyone on her team, boasting a full 30 points played in their semifinal and final alone. She took over in bracket play and helped Fury remain undefeated at Nationals with an effective +/- of +10, the highest of any player on the team. If you haven’t already, folks, it’s time to hop on the Finney bandwagon. Space is filling up fast. We weren’t far away from crowning Groom the Player of the Year for the second time in three seasons. 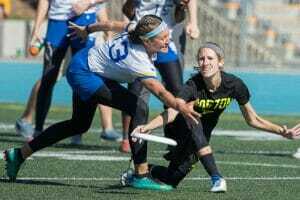 Coming into Nationals, she was the frontrunner, and certainly was the regular season MVP. A quiet Nationals, in which she tallied seven goals, seven assists, and nine blocks, opened the door; Groom was surprisingly absent on the score sheet in Boston’s semifinal and final. She recorded 25 touches in those two games, making her third of Brute Squad’s cutters, with just one block and two throwaways, while leading the team points played with 28. For context, she was the only one of those high-touch cutters to get significant D-line run, though she played some offense, as well. But even with a subdued Nationals statline, Groom amassed 26 goals (tied for second on the team), 20 assists (first for cutters), and an eye-popping 20 blocks (first on the team) through the team’s TCT events. Her incredible performance over the breadth of the season impressed enough to earn her yet another accolade. The Silent Assassin was as good as ever in 2018. 10 goals, three assists, and five blocks at Nationals, and 26 goals, nine assists, and eight blocks over the course of the season are par for the course for the division’s most consistent offensive cutter. She led Brute Squad in plus/minus in both the semifinal and the final, registering six goals, two assists, and three blocks, with one turn over the two games. Had Brute Squad been able to hang on to win in the final, the Hoffmann vs. Groom debate for POTY would have been fierce. And perhaps had Brute’s ace O-line had been 100% at the end of the game, they would have been able to eke out the title. Struggling through a cramp, Hoffmann couldn’t play on the team’s penultimate O-line point, and was unable to get on the field for the start of double game point. As strong as Hoffmann was this season, even against the toughest matchups, it’s hard not to feel like she could have been the difference in those final moments of a game that was decided by such slim margins. Even without the title, Hoffmann still holds a strong case for being Player of the Year. The precision of her dominance is so rare, even among the players winning these awards. Her combination of elite cutter tools and ruthless consistency make her one of the most fun to watch — and best — players in the game. Comments on "2018 Women’s Club Player of the Year, Presented By Greenbackr"